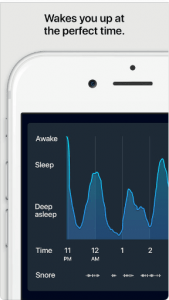 Sleep Cycle helps millions of people to wake up rested. Featured in: CNN, Wired, The Guardian, The Wall Street Journal, BBC, The New York Times. Sleep cycle is continuously rated as the best smart alarm clock and is the world’s most used intelligent alarm clock. Our patented technology monitors your sleep movements using sound or vibration analysis. Recommended placement: Near the bed or on the floor.